For the past few years, the Meadowlands Commission and a bunch of volunteers have been helping New Jersey Audubon and New York City Audubon with a project called the Harbor Herons Project. The object is to study the foraging behavior of egrets and herons that roost on the East River and near Staten Island to see if the birds from different nesting colonies are foraging at different sites and to see how the birds use the metropolitan landscape, including the Meadowlands. This year, researchers have banded several birds and put transmitters on some in an effort to keep track of their travels. Some of those birds — great egrets, and double-crested cormorants, have been seen in the Meadowlands — and the great egret’s radio signals have been picked up here. You can help the research by keeping your eye out for banded/transmitter birds. 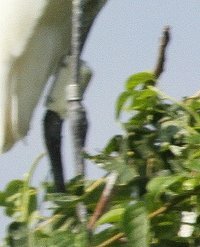 The photo on the left is of a great egret youngster with a silver band on its right leg and a transmitter on its left leg (image enlarged on right). Click "Continue reading" immediately below to learn more. 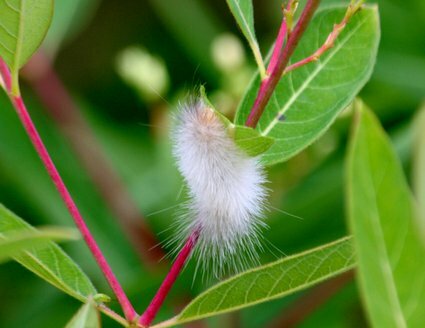 We took this shot of a mystery caterpillar last month by the AMVETS Carillon in North Arlington.